Moses gives warning to the Egyptians that all the firstborn in Egypt will die (Exodus 11:4–5). Moses explains to the Israelites the Passover (Exodus 12:21–28). Death was sure to come to every house. But If the blood was applied, the destroyer (death) would not be permitted in that house. The Lord’s supper was celebrated during the Lord’s Passover. Jesus was and is the mediator of the better covenant; he was bringing God to man, and he was bringing man to God. He offered himself as the perfect sacrifice. His holy body and blood is the surety, the guarantee of our covenant with God. When we apply the blood of Jesus to our life, we are protected from every plot the enemy has for us or our family. The lamb sacrificed was a lamb without blemish (Exodus 12:3–7). Jesus was our Lamb without blemish (1 Peter 1:19). Jesus offered himself as an unblemished sacrifice (Hebrews 9:12–14). Jesus was the perfect Passover Lamb (Exodus 12:46; 1 Corinthians 5:7). The Israelites were miraculously healed because of the Passover Lamb (Psalm 105:36– 45). We are healed because of our Passover Lamb (Isaiah 53). The power of the Lamb heals and provides, protects and delivers (Revelations 12:11). How and When the Blood Was Used? The highest act of the high priest in the Old Testament was when he entered into the holy of holies, bringing in the blood to worship God. The highest act of worship was the sprinkling of blood. -In the consecration of the house of the Lord. -In the consecration of the priest. -At the birth of a child. -In the account of sin. -In the way they would fellowship with God. The blood has a voice and that voice speaks. Priests used the blood in everything. Jesus made an end to the types and shadows by being the fulfi llment. Our hearts must learn the importance of walking in the power of the blood. God lives in constant view of the blood, so we must live in constant view of the blood also. The blood of Jesus is the primary thing the Holy Spirit has for the church today. When Adam sinned, he poisoned his blood, causing every man after him to experience blood poisoning also. Since man had sin entangled in his blood, he passed sin from generation to generation. God had to do something to take care of the blood. God sent Jesus to the earth in the flesh to destroy the works of the devil. Jesus was flesh and blood, but he was not from Adam’s fallen bloodline. Jesus suffered the death of the cross for us (Acts 2:31; Hebrews 9:23–26). It was necessary for the earthly things to be purified, but the actual heavenly things needed a better and noble sacrifice. The priest would take the blood in and sprinkle it on the mercy seat. The mercy would last a year before another sacrifice would have to be made. Jesus took his own blood before the Father and poured it out on the mercy seat. It was a once-for-all offering. Webster’s Dictionary: appeal, entreat earnestly, to use arguments or persuasion for or against something. Hebrew–reev–to strive; conduct a legal case. 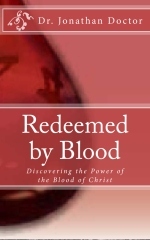 The blood of Jesus paid the price, and the blood was sufficient, more than enough. In our case, there are two types of pleading: by the plaintiff and the defendant. A plea is a petition to the court. In our case, the answer is in the acquisition of the blood. This means that we have already won. When we use the word plea, we are reminding Satan of his defeat, because we have authority in the blood. A plea is a method of condescending by rules of procedures, by which a party will present a written statement about the facts of the case. Pleading the blood has two connotations. 1.) It is evidence of our civil rights. 2.) It is an acquittal of our criminal matters. -No contest (neither admits nor denies). The Israelites, by faith sprinkled blood in Egypt, and it brought forgiveness, health, protection, deliverance, strength, and wealth (Hebrews 11:28; Psalm 105:36–45). 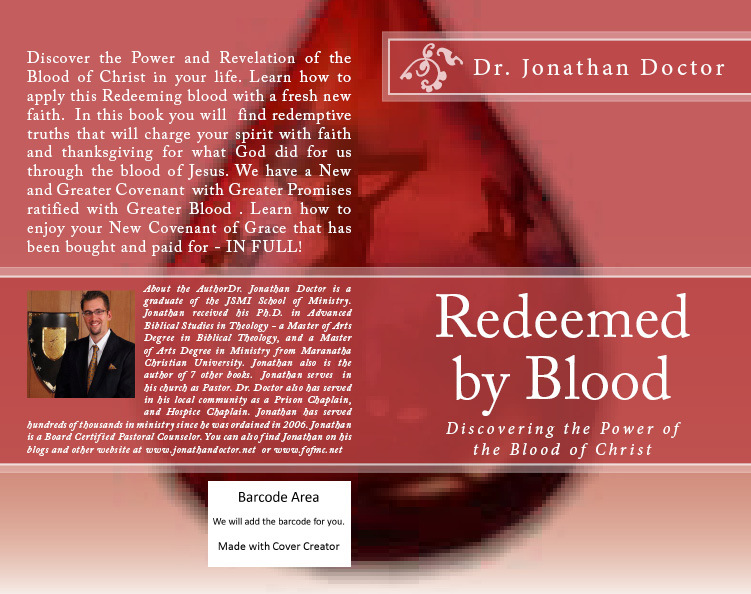 Rahab used the blood line (scarlet cord) as a token, and it brought deliverance. Priests of the Old Testament sprinkled blood, and it brought forgiveness. Jesus as our High Priest put his own blood on the mercy seat, and it purchased salvation for all mankind. We as new testament sons of the High Priest can now use the blood for forgiveness, salvation, redemption, healing, protection, and victory. We shall observe this sprinkling of blood forever (Exodus12:24). Proverbs 19:21 says that many are a man’s plans, but the Lord’s Purpose will Prevail. 1 John 5:4 says that whatever is born of God overcomes the world: and this is the victory that overcomes the world; our faith. Before we were born God had a plan for our life. According to the Word of God in Acts 17:26 He planned what we were called to do, the time, the place and boundaries where we are to do it. Our God, in His awesome Wisdom chose us to live in this day, He did not choose St. Paul not St. Peter but you and I to be the last generation before the Coming of the Lord, He has Graced us to bring in the Harvest. To me that is an awesome thought, and it is a sobering responsibility, but at the same time it is a relief to know that we do not have to trust in our own human, natural strength to do it but by His Grace. God’s Grace, His abilities and gifts will empower us as we go and step out into that Calling that He has Graced and anointed us to do. God ‘s Calling on our life will never be taken away, God does not change His mind (Romans 11:29Amp), what He spoke will come to pass, He declared the end from the beginning. He declared that we would be His Glorious Church to show this world the Love of God. Jesus has declared that He is building His Church and the gates of hell shall not prevail against His church. This is good news to know, that as adversity and adversaries show up on our way to the destination God has for us that the adversities or mountains ahead are temporal, they are temporary, they are changeable and movable. With this attitude and spirit of faith we know that we are overcomers because God does not change His Word, Name or Mind about us or our calling. This is Good news to those who might have had or are having small beginnings, knowing that adversity and circumstances cannot change God’s mind, knowing this creates a NO QUIT attitude. God’s plans Will come to pass. God had orchestrated our lives, He has ordained our steps and works according to Ephesians 2:10 and Psalms 37:23. Just like Jesus knew where He came from and where He was going (John 8:14), we too can and should know where we are going. By knowing where we came from, we can look back and see God ordaining our steps in life, getting us to this day and the days ahead. Once someone has spent quality time with God, intimate time in prayer, praying in the Spirit and continues to read His Word and listen to the Voice of the Lord. They can develop this knowing in their heart to the Call of God and to where they are going. Jesus said that His sheep hear His voice and His sheep follow Him, so as someone hears the Lord they must do what He says. We as sheep do not want to get out from under our Shepherd’s Care. This excites me about the days ahead, because in knowing God’s call on my life and knowing in what direction He is leading me, I have assurance that my Shepherd will not lead me astray as I obey His voice. We must stay faithful to the Call of God in the small beginnings and in the adversities in our lives, as we do the Lord will increase us and we will be given more, because we have proven our faithfulness in the small things. God is looking for some people who are willing to fulfill His prevailing purpose and Call on their lives. 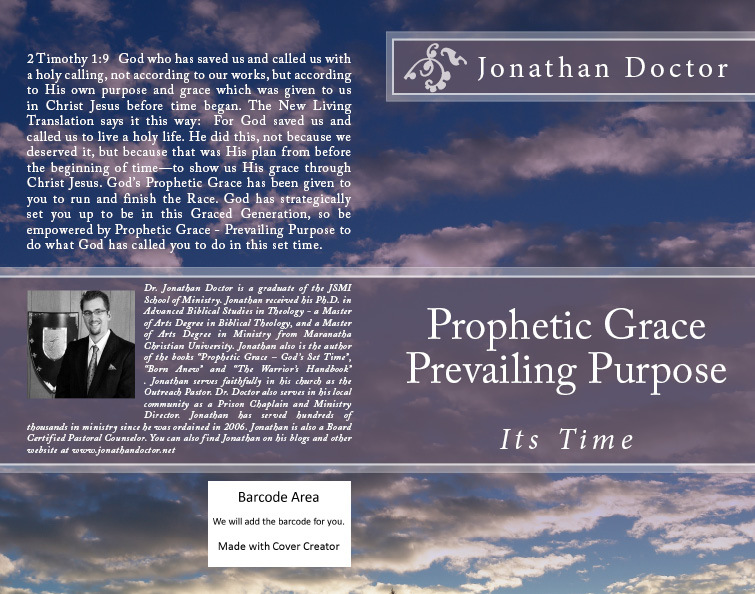 As we continue to run the race that God has set before us we can be sure that we have Prevailing Purpose! Jesus is our surety, our guarantee. This is the most vital of all the ministries of Jesus at the Father’s right hand. Under the Old Covenant, The high priest was the surety. If he failed, it interrupted the relationship between God and Israel. The blood of the atonement lost its effectiveness. Under the New Covenant, Jesus is our High Priest and the Surety of the New Covenant. Our position before the Father is absolutely secure. We know that throughout our lifetime here on Earth we have at the right hand of God a Guarantee who is there for us. He is representing us before the Father, He is our Advocate, our Mediator, our Intercession, our position in Him is secure. A. As the Old Covenant was sealed with circumcision, the New Covenant is sealed with the New Birth. 1. Jesus is our Surety, our Advocate, our Mediator, our Intercessor, and High Priest . 2. Surety = to act as a mediator between two covenanting parties; a guarantee. One who becomes responsible for another. Christ is the surety of the better covenant (Heb. 7:22). In him we have the assurance that all its provisions will be fully and faithfully carried out. 3. Advocate = one who pleads another’s cause, who helps another by defending or comforting him. Comforter, lawyer. 5. Intercessor = His advocacy with the Father for his people rests on the basis of his own all-perfect sacrifice. Thus he pleads for and obtains the fulfilment of all the promises of the everlasting covenant (1 Jn. 2:1; Jn. 17:24; Heb. 7:25). He can be “touched with the feeling of our infirmities,” and is both a merciful and a faithful high priest (Heb. 2:17, 18; 4:15, 16). This intercession is an essential part of his mediatorial work. Through him we have “access” to the Father (Jn. 14:6; Eph. 2:18; 3:12). 1. Atonement = This word does not occur in the Authorized Version of the New Testament except in Rom. 5:11, where in the Revised Version the word “reconciliation” is used. In the Old Testament it is of frequent occurrence which means “to cover” Christ did not “cover our sins, He wiped them out, removed them. Note: Also Jesus used the same Word in Luke 4:18 twice as “deliverance” and again as “liberty”. Throughout the New Testament the Word forgiveness and remission are the same words. Point: Jesus is our assurance before the Father, He is our “Once and for All” sacrifice that took away All our sins; He is our Advocate when we sin, He is faithful and Just(1John 1:9). Jesus Christ fulfilled all the righteous requirements of the Law for us (Rom.10 ) and He also satisfied God’s wrath for our sins. He took our punishments of sin, and He gives us His rewards of Righteousness. He is our Surety, our guarantee of this Blood Covenant that we are in with God; actually this blood Covenant is between God and Jesus. This better Covenant includes us but does not depend on our works but His Finished Work thru His sinless Holy Life on earth, His Work of Substitution on the Cross as a spotless Lamb, in hell itself separated from God and then made alive and risen at the right hand of God forever making intercession for us. This is a Covenant of Grace. When we refuse to forgive others, we are unable to receive forgiveness and answered prayers from God. But when we set our will to forgive, God forgives us and cleanses us from unrighteousness so that we can escape the guilt, condemnation and fear associated with sin. God forgives, loves and accepts us based on Jesus’ sacrifice on the cross (Ephesians 1:6-7). Condemnation is an emotion associated with guilt and fear that makes us feel unworthy and undeserving of God’s blessings. Sin robs us of the boldness and confidence we need to believe that God’s Word will work in our lives. Sin often stops people from praying, believing and attending church. God blots out our transgressions so that He can bless us (Isaiah 43:25, AMP). God cleanses us from unrighteousness when we confess our sins (1 John 1:9). God erases our sins and promises never to remember them again. Just as God forgets our sins, we should also forget them. Remembering past sins opens the door for condemnation, guilt and lack of confidence toward God. If you remember your sin and meditate on it, you will eventually repeat it. God instructed us to remind Him of our merits (Isaiah 43:26, AMP). Boldly remind God that you are in right-standing with Him through Jesus Christ and that you expect to receive His blessings and favor. Jesus nailed our sins to the cross and wiped them out forever (Colossians 2:12-14). God requires that Christians forgive those who sin against them (Mark 11:25-26). If we refuse to forgive others, we will not be forgiven. Prayers are hindered when unforgiveness operates in our lives. Unforgiveness is a fear-based stronghold that hinders the blessings of God. Deliverance, promotion, healing and increase are directly linked to forgiveness. Forgiveness is an act of faith, given in spite of another person’s actions. Jesus instructed us to declare our forgiveness for others each time we pray (Matthew 6:12). God has forgiven our sin debt, so we must forgive each other of all debts, regardless of the severity or frequency (Matthew 18:21-35). Jesus told Peter that there is no limit to the number of times we must forgive (v. 21-22). Those who refuse to forgive others are considered wicked (v. 32). Unforgiveness opens the door to torment (v. 34). Forgiveness is an act of the will and a decision to walk in the love of God. Loving others involves forgiving them just as readily as Jesus forgives us (Colossians 3:13, AMP). Married couples should be mindful to forgive each other instantly so that their prayers will not be hindered (1 Peter 3:7). Grace IS simply a Free Gift. In most cases Grace in the Bible refers to God’s Unmerited Favor; In other words, unmerited is another way of saying Free; or you get it even though you didn’t earn, merit or pay for it. I want to point out that God’s Free Gift of Grace and Favor is NOT a LICENSE to sin. Jesus is a perfect example of the Character of Grace. Lets look at the Word to see my point. John 8:4 They say unto him, Master, this woman was taken in adultery, in the very act. John 8:5 Now Moses in the law commanded us, that such should be stoned: but what sayest thou? John 8:6 This they said, tempting him, that they might have to accuse him. But Jesus stooped down, and with [his] finger wrote on the ground, [as though he heard them not]. John 8:7 So when they continued asking him, he lifted up himself, and said unto them, He that is without sin among you, let him first cast a stone at her. John 8:8 And again he stooped down, and wrote on the ground. John 8:9 And they which heard [it], being convicted by [their own] conscience, went out one by one, beginning at the eldest, [even] unto the last: and Jesus was left alone, and the woman standing in the midst. John 8:10 When Jesus had lifted up himself, and saw none but the woman, he said unto her, Woman, where are those thine accusers? hath no man condemned thee? John 8:11 She said, No man, Lord. And Jesus said unto her, Neither do I condemn thee: go, and sin no more. John 5:5 NLT One of the men lying there had been sick for thirty- eight years. John 5:12 “Who said such a thing as that?” they demanded. John 5:13 The man didn’t know, for Jesus had disappeared into the crowd. I want you to notice that Jesus Restored the woman in Adultery and forgave her and did not condemn her but said “go and sin no more“. You see Grace will Forgive and Restore a person BUT Grace also says “Go and sin No More”. Also notice the paralyzed man who was made whole, Grace Healed him but Grace also said “Stop sinning or something worse will happen“. You see the problem in some churches today is that they go too far to the right or too far to the left. They either Condemn a saint for their sins, or they make Grace a License to sin and do whatever because they believe that “Once saved Always Saved”. The True Meaning of Grace is Restoration, Healing and ‘Go sin no more’, live a Holy life. So the balanced teaching and definition of Grace when related to sin is to Restore, Heal, Deliver and then Go and sin no more. Correction has its place, but don’t let Condemnation keep you or anyone else from Restoration, Healing and every other benefit of Grace. Grace Teaches us to Live Holy Lives. The Once saved Always saved teaching cannot be a correct aspect of Grace. Just like a man and a woman come together in Holy Matrimony; as they do, they make a commitment to be together until death if need be. Unfortunately many marriages end up in divorce even though they made a commitment to be united forever. Someone in that marriage walked away from that Covenant, in the case of Marriage, sometimes they both walk away from their Covenant and Commitment to God and each other. Our God does not walk away from His Covenant with us; man always is the one to walk away from God. Called to the Kingdom for such a Time as this. Like Esther, You are called into the Kingdom for such a time as this. Like Esther was called into the Favor and Grace of God to deliver her generation so you are called to the Grace and Favor of God to deliver your generation. Like Moses was an instrument and vessel of God to Deliver the Children of Israel from Pharo’s slavery so are you called and Graced to bring Deliverance to this generation from the slavery of satan, sin and the evil world system (Galatians 1:4) Like Ester You are Called into the Royal Family to Exercise your Authority and to set the captives free. You may feel like Mephibosheth in Lodebar, but God is Calling you to the Kingdom, to be a King’s Kid! Mephibosheth was called to the Kingdom because his father Jonathan had a Covenant with King David. Mephibosheth was in Lodebar, Lodebar was a place of lack, a place of poverty and inadequacy. You may feel the same way, you may be in a place of lack of health, finances, lack of hope, lack of The One True God. But I am here to tell You that you don’t have to be broke any more! You don’t have to be sick anymore, you don’t have to be in lack anymore! Your Days of living in Lodebar are over! You are a King’s Kid and you have been summons to theKingdom of God. God is calling you to a higher Life, a Royal Lifestyle, a Good Life. God has Prophesied Grace and Favor to You, this Grace and Favor will get you out of Lodebar and bring you in to the Kingdom. Like Joseph in the pit, You can go from the pit to the Palace by the Grace and Favor of God! Act 3:24 Amplified Indeed, all the prophets from Samuel and those who came afterwards, as many as have spoken, also promised and foretold and proclaimed these days. This Prophetic Grace will change and re-arrange things in your life. Grab hold of these Truths I share with you and put them to practice. Do not let the devil or any religious ‘stinkin thinkin’ person talk you out of your Prophetic Grace, Take Your Place in the Grace and Live the Life God Prophesied You to Live. Eph 2:7 (Message) Now God has us where he wants us, with all the time in this world and the next to shower grace and kindness upon us in Christ Jesus. Eph 2:7 That in the ages to come he might shew the exceeding riches of his grace in [his] kindness toward us through Christ Jesus. Eph 2:7Amp He did this that He might clearly demonstrate through the ages to come the immeasurable (limitless, surpassing) riches of His free grace (His unmerited favor) in [His] kindness and goodness of heart toward us in Christ Jesus. Eph 2:10 For we are God’s [own] handiwork (His workmanship), recreated in Christ Jesus, [born anew] that we may do those good works which God predestined (planned beforehand) for us [taking paths which He prepared ahead of time], that we should walk in them [living the good life which He prearranged and made ready for us to live]. By the Spirit of God Paul wrote this Ages ago about his and our day, about this Grace, this Favor, this Salvation offered to those who will accept it. Eph 1:4 Amplified Even as [in His love] He chose us [actually picked us out for Himself as His own] in Christ before the foundation of the world, that we should be holy (consecrated and set apart for Him) and blameless in His sight, even above reproach, before Him in love. Eph 1:6 [So that we might be] to the praise and the commendation of His glorious grace (favor and mercy), which He so freely bestowed on us in the Beloved. Eph 1:10 [He planned] for the maturity of the times and the climax of the ages to unify all things and head them up and consummate them in Christ, [both] things in heaven and things on the earth. Rom 8:28 Amplified We are assured and know that [God being a partner in their labor] all things work together and are [fitting into a plan] for good to and for those who love God and are called according to [His] design and purpose. Rom 8:29 For those whom He foreknew [of whom He was aware and loved beforehand], He also destined from the beginning [foreordaining them] to be molded into the image of His Son [and share inwardly His likeness], that He might become the firstborn among many brethren. Rom 8:30 And those whom He thus foreordained, He also called; and those whom He called, He also justified (acquitted, made righteous, putting them into right standing with Himself). And those whom He justified, He also glorified [raising them to a heavenly dignity and condition or state of being]. Act 17:29 Forasmuch then as we are the offspring of God, we ought not to think that the Godhead is like unto gold, or silver, or stone, graven by art and man’s device. Act 17:31 Because he hath appointed a day, in the which he will judge the world in righteousness by [that] man whom he hath ordained; [whereof] he hath given assurance unto all [men], in that he hath raised him from the dead.